There are currently 182 people online. In the past Arctic Cooling was known for its cooling products but in more recent years the company has turned towards other domains, including a bunch of consumer electronic devices. Now the company introduces the S111 speaker series, one model with a 3.5mm audio jack and one with Bluetooth 4.0 for wireless streaming. 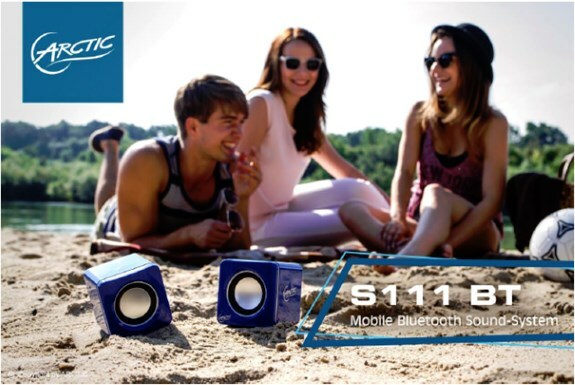 Through the Summer with the Sound-Systems ARCTIC S111 M & ARCTIC S111 BT Having a barbecue, swimming, sunbathing - in the summer you could spend the whole day outside. But if you want to hear something else than just the chirping of birds, you will be well served with ARCTICs new sound-system duo S111 M and S111 BT. A built-in battery makes the stylish mini cubes to ideal companions for your smartphone, tablet and laptop. Compact and lightweight, they easily fit into your pocket and still provide exceptional sound. With strong bass and higher volume they have nothing in common with the tinny sounds of conventional laptop and cell phone speakers. Thanks to a 80 cm cable between the speakers even a true stereo experience is possible. You don’t have to worry about flat batteries along the way. With the LED battery level indicator you always know how much juice you have left. Greater possibilities through wireless freedom is provided by the ARCTIC S111 BT. With a built in high gain antenna the speakers have a significantly extended range in contrast to standard Bluetooth devices. A chipset of the latest generation brings out the best of the music and allows lossless audio streaming. So you never miss a detail and you can listen to your songs with a new spectrum of tonal possibilities – anytime and anywhere.